PERUGIA-World’s smallest pony Charlie has been reunited with owner Bartolo Messina after being kidnapped by Italian criminals as part of a ransom ploy. 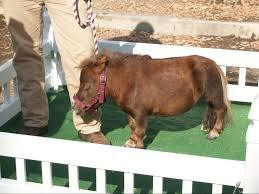 Charlie-one of the smallest ponies in the world with a height of 24.8 inches-was said to be visiting Citta di Castello for the 47th annual horse fair when three Italian thieves broke through the stable’s security by cutting through a wired fence and fled with young Charlie during the night. Sources say that the three arrested kidnappers were seeking ransom money from Charlie’s owner, Bartolo Messina, who feared that Charlie’s fame within the equestrian world would eventually put him in danger. Angelo Capecci, president of the national horse show spoke out about the incident; “We have been victims of a serious criminal act that offends and humiliates the equine world. The security measures that for years have ensured the safety of the participants and that have always prevented the occurrence of similar incidents were apparently undermined by a shameful act that does no reflect the horse world and its values. Reports confirm that young Charlie was found on Thursday near Lake Garda, 340km from where the kidnapping took place, and is now back in the safe hands of his owner.